If friends say to you that they will see meet you on Shirley Street, your first question will probably be "Where on Shirley Street?" Your friends might then reply, "We'll meet you at Shirley Street and Mackey Street." Then you would know exactly where to go. Similarly, it is not enough to say "The city is somewhere on latitude 40°N." You have to know where on 40°N. In map reading you would give the number of the line on longitude that crosses 40°N. 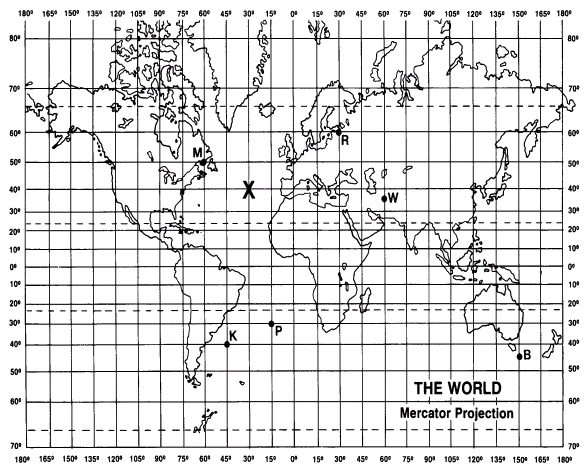 Thus, as you can see on the map there is a large X at the point where 40°N is crossed by 30°W. When writing latitude and longitude positions it is important to include N or S, E or W. 10°S, for example is a different line than 10°N; 90°W is a different line than 90°E. Print a G at 10°N - 75°E. Move eastward 15°. Print a dot and the letter T where the lines of latitude and longitude cross.